Georgetown's Mac McClung draining a three-pointer with 6:07 left. Photo by Jason Schott. 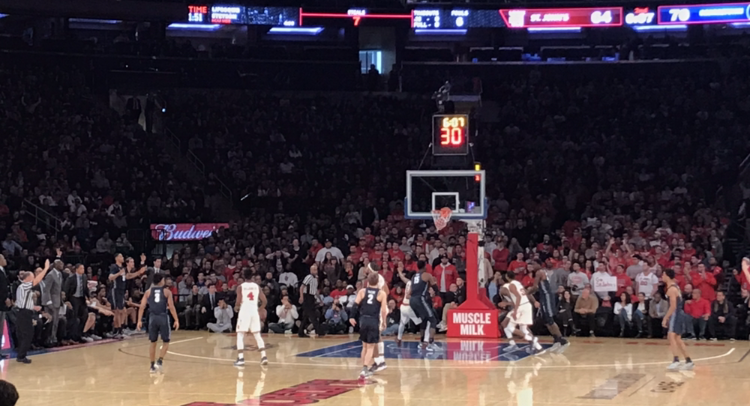 The Georgetown Hoyas outlasted St. John's, 89-78, on Sunday at Madison Square Garden, getting revenge for an overtime loss at their building on January 5. The Hoyas, who improved to 3-4 in Big East Conference play and 13-7 overall, were led by Mac McClung, who had 25 points on 9-19 from the field, including 4-10 on three-pointers, with 5 rebounds and 5 assists. Jessie Govan had 20 points (7-14 FG, 2-3 on three-pointers) with 9 rebounds, just missing a double-double, and an assist. Josh LeBlanc had 15 points (4-5 FG, 1-1 on threes), 6 rebounds, and an assist. James Akinjo had 8 points (2-5 FG, 2-3 threes), 7 assists, and a rebound. St. John's was led by Shamorie Ponds, who poured in 21 points on 8-17 shooting, including 1-5 from behind the arc, with 6 rebounds, 3 assists, and 2 steals. Mustapha Heron had 18 points (7-16 overall, 2-5 on 3-pointers), 5 rebounds, and an assist. LJ Figueroa had 14 points (6-11 FG, 2-2 on threes), 6 rebounds, 4 steals, and 3 assists. Marvin Clark, had 12 points, right in line with his average of 12.4 points-per game, but he shot a dreadful 3-15 (0-4 in the second half) overall and 2-9 on three-pointers, with 3 rebounds and 2 assists. He was pulled with 5:50 remaining in the game, and was only brought back after the game was in doubt, with 40 seconds left. The first half was a very even battle, which Georgetown dominated late, taking a 41-37 lead into halftime thanks to 13 points from McClung and 12 from Govan. St. John's got nine first-half points apiece from Clark, Ponds, and Figueroa. The game was tied at 50 four minutes into the second half on a Ponds layup, but Georgetown took over from there. The Hoyas went on a 10-0 run over the next three minutes capped by a three-pointer from Jagan Mosely (his only basket of the game) to make it 60-50. Georgetown basically maintained it for awhile, as a McClung three made it 74-63 with 6:07 left. St. John's responded, with a Sedee Keita layup making it a three-point game, 75-72, with 4:01 remaining. One of the biggest plays came with 2:20 left when Ponds went up for a layup, but Govan held his arms back and did not touch Ponds, who ended up missing the layup, keeping it at a four-point game, 77-73 Georgetown. St. John's was still down by four (79-75) with 1:47 left when it was ruled off of Georgetown's James Akinjo along the baseline, as he had trouble handling the inbounds pass. After a lengthy review since it was originally ruled off St. John's, Ponds made a layup to make it 79-77 with 1:45 on the clock. Ponds then got a steal with 1:20 left, but it went off Justin Simon in the corner, a huge break for Georgetown. 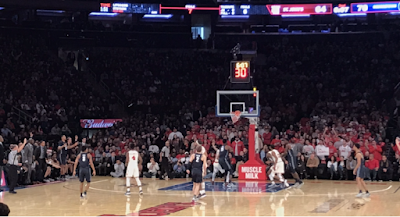 The Hoyas then had issues inbounding it, and Figueroa picked off a pass at center court, raced down and missed a jumper from the top of the key, then Simon got an offensive rebound, missed the put-back at 1:11, and then McClung got the offensive rebound and raced to the other end for a dunk to make it 81-77 Georgetown. That was the start of a 10-1 run to close out the game for the Hoyas. In the second half, Georgetown shot 45.2 percent (14-31) overall, including 50 percent (7-14) from behind the arc, and they held St. John's to 35.9 percent (14-39) overall, and 25 percent from behind the arc (3-12). St. John's has now lost four of five and they are 3-5 in Big East play, making their 12-0 start in non-conference play in November and December feel like a distant memory. The "tough three-game stretch" that Ponds is referring to starts at Creighton on Wednesday night at 8:30 p.m., followed by a trip to Cameron Indoor Stadium to take on Duke on Saturday at noon, and at Marquette on Tuesday, February 5 at 8 p.m.